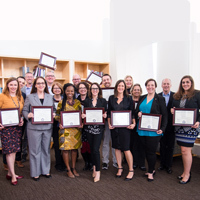 Webster University’s Global Leadership Academy received two awards at the 38th annual LEAD Awards, which recognize organizations’ outstanding leadership training and development programs. 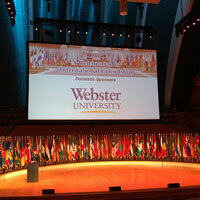 Among corporate, educational and public entries, Webster's leadership development program was the top university in the categories of Best Social Collaboration and Knowledge Sharing and Best Global/International Program. The 2018 cohort of Webster University's Global Leadership Academy has been announced. Congratulations to these faculty and staff, who will bring a diverse range of perspectives from throughout the network to their journey together in 2018. 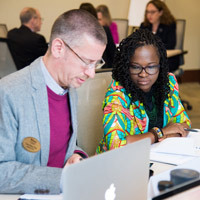 The 2017 cohort of Global Leadership Academy has its final sessions together Friday, concluding an 10-month journey of leadership development and reflection and deeper understanding of the complexities of the Webster University network. 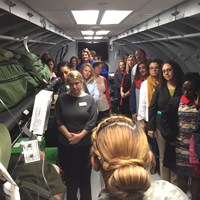 Fellows visited Scott Air Force Base on Thursday for perspectives on military and online education, while Friday features a wrap-up session and group project presentations. Congratulations to the 2017 GLA fellows! 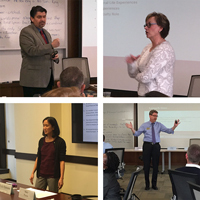 The 2017 Global Leadership Academy cohort continues its fall week Wednesday with sessions on marketing and communications, working with Advancement, inclusive leadership, followed by a visit to the Scott Air Force Base location on Thursday. The 2017 Global Leadership Academy cohort meets throughout this week for its fall session and final week together. 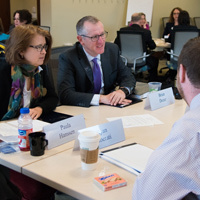 On Monday morning the fellows heard from President Stroble and Provost Schuster on leadership, from Walker School dean Simone Cummings and Lori Sharp on preparing students for graduation. The afternoon includes a session with Ana Karaman, chief financial officer. Tuesday brings a deep dive into learning-centered leadership. 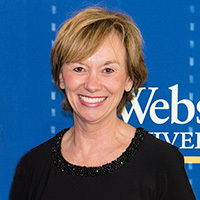 Jenny Broeder has been named director of the Global Leadership Academy (GLA), Webster University’s leadership development program for faculty and staff. She will assume duties from the current GLA director and dean of University Libraries, Laura Rein, who is retiring from the University in December 2017. Broeder, a professor of nursing in Webster’s College of Arts & Sciences, will assume this role in October 2017. Applications for the 2018 Global Leadership Academy are now open. 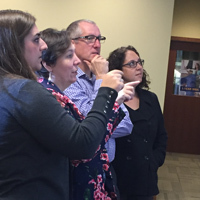 Faculty and staff throughout the Webster University network are encouraged to apply for this cohort program, which entails a series of workshop and activities that help faculty and staff lead successfully within the university. There will be three information sessions at the end of August for those interested in applying by the application deadline of Sept. 29. The Global Leadership Academy 2017 cohort concluded its summer week in Thailand with group presentations on different topics in higher education and Webster's network, followed by a campus thank you lunch and farewell dinner. They now head back to their respective campuses before a final week together in the fall in St. Louis. The application period for 2018 GLA opens July 28. The 2017 cohort of Global Leadership Academy continued its summer session in Thailand with leadership and personality reflections with David Pendleton before the group transferred from Bangkok to Cha-am, with cultural activities along the way including a visit to Phra Nakorn Khiri National Museum and Historical Park. The group also participated in the nationwide creation of 60 million paper flowers to commemorate the king who passed away last year. 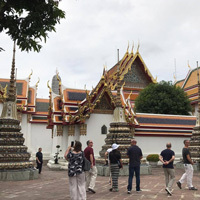 The summer session for the 2017 Global Leadership Academy opened this past weekend in Thailand with a cultural tour of Bangkok followed by Monday's international campus focus and symposium on leadership. 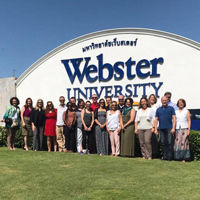 The cohort will remain in Thailand's capital for the first half of the week before relocating to Cha-Am and Webster's campus there. The Global Leadership Academy directors have announced the destinations of the June sessions for the 2018 and 2019 cohorts. The 2018 cohort will take a deeper dive into the U.S. metro and military campuses, exploring campuses in Florida in June 2018, enabling additional fellows from the international campuses and applicants in the U.S. who cannot do longer-distance travel. The 2019 cohort will return to international travel, visiting the campus in Accra, Ghana, in June 2019. 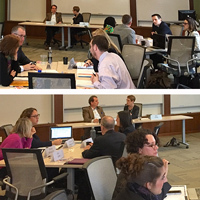 The 2017 cohort of Global Leadership Academy fellows is spending the year working around the theme of "Informed advocacy for engaged leadership." This theme is framed in five sessions delving deeper into the lifecycle of the student from recruitment through the alumni experience. The group's spring week together in St. Louis wrapped up with Webster experts explaining how different points in this cycle are handled. Global Leadership Academy's week in St. Louis continued with examinations of ways to support students as learners, with presentations on Tuesday and Wednesday from Institutional Effectiveness, the Faculty Development Center, the dean of the School of Education, a student panel and leaders of metro campuses. The 2017 cohort of Global Leadership Academy (GLA) fellows met in person for the first time Monday morning, part of a week of learning and collaboration activities together at the home campus in Webster Groves. The president and provost welcomed them and led a morning session based on trends in higher education. Midwest regional director Katie Ervin was elected to the Command and General Staff Foundation board of trustees, Global Leadership Academy directors Holly Hubenschmidt, Erik Palmore, and Laura Rein co-authored a panel presentation on global inclusive leadership development for an international conference, and librarian and archivist Kathy Gaynor had a counseling teaching reflection published in the book, "The One-Shot Library Instruction Survival Guide."